Yes, my celebrity hair crush is a bit of an obvious one: Rihanna. In my eyes the woman can do no wrong. Whether it’s short, long, black or pink, her hair always looks amazing. Her hair journey fascinates me. Since she first launched her music career, the Bajan star has had a million different hair styles and seems to change the cut and colour of it weekly. Whilst the singer has always been a source of hair- spiration for her adoring fans, I believe that it’s usually Rihanna’s most natural hair looks which look most beautiful on her. However, I do admire her ability to rock a black crop one day, then an Auburn mid- length style the next, via a peroxide blonde bob. 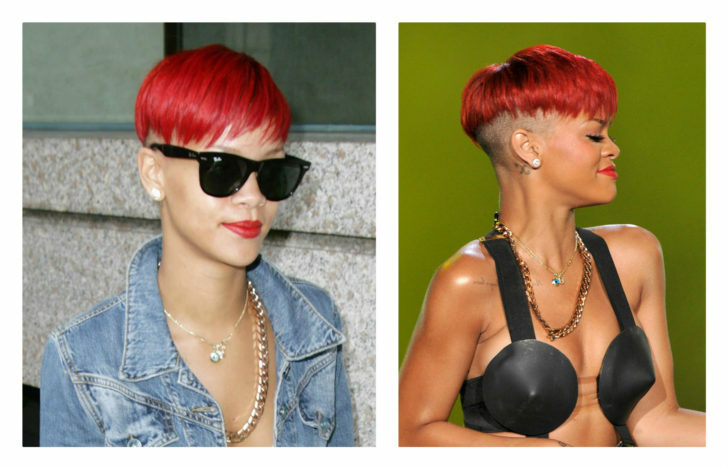 My favourite look of Rihanna’s was her ‘red hair era’. I loved how well the bright shade complemented her skin tone and despite it being a bold colour, it somehow didn’t look out of place on the confident superstar. One particular red hair look which I think was the best was in her video for her single, ‘California King Bed’. Rihanna’s hair was long and had been styled into loose, undone curls with a sweeping side fringe. The relaxed look added softness to an otherwise statement look and was my favourite of her’s from her time as a red head. However, despite Rihanna’s seemingly long running success with having the perfect hair time and time again, she too has been victim to the occasional hair- don’t. Despite a team of stylists on hand and her own personal hair dresser, the odd dodgy- do has escaped through the net. One example was when her hair was shaved underneath and a red spiky layer was left on the top part… Perhaps a bit too edgy for the pop princess! Another less desirable look for her was a black and yellow striped bowl cut, again with slight shaved sections just behind her ears. I don’t really know where to start with that one so I’m just going to let it speak for itself and hope it doesn’t happen again! Whatever she does with her hair, Rihanna always seems to suit it (nine times out of ten!) and that is why she is my ultimate celeb hair crush. Despite her odd less than great style, she never fails to look fantastic and always carries off a new look with ultimate confidence, which is something I think we could all learn from her whenever we feel unsure of a new hair do!